Anthony Martial now understands what he has to do win regular selection for Manchester United, according to manager Jose Mourinho. ‘I think he coped well with his development process. It took quite a long time to understand what we want from him,’ Mourinho said after the match. ‘It took quite a long time for his brain but also his body to be ready to play the way we want him to play. ‘He is understanding now things that he didn’t before, and he wants to play and he knows that to play and to be consistent in the team he has to go in a certain direction. He’s finding that direction. ‘His performance today without the goal would be a good performance, and what I want from him is exactly that. You cannot score every time you play, there are matches where you are not going to score. 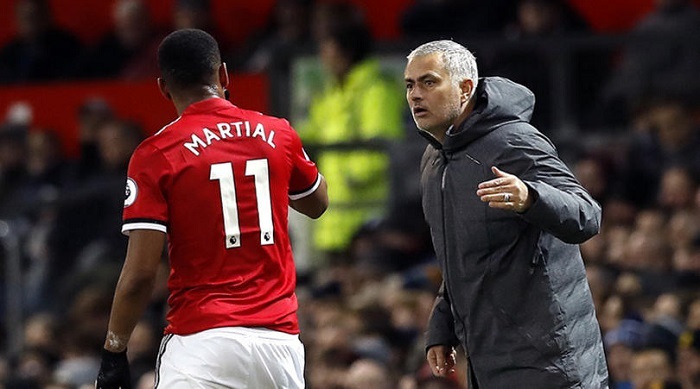 As for apportioning credit for Martial’s re-emergence, Mourinho added: ‘Well if when the players are playing bad it’s my fault then when the players are playing well it’s my responsibility! ‘I like the player that wants to take it. And Paul wants to take [penalties], and that for me is fantastic. If he misses, he misses,’ the Portuguese said.